Lefkas sailing itinerary takes you to the beautiful bays and coves of the Ionian Islands off Greece's northwestern shore. They are among the most scenic in Greece, with woodlands spread over the hills like an emerald carpet. Sandy beaches and picturesque fishing villages add to the beauty. The ambience is peaceful and serene, the waters and balmy winds inviting. The typical Lefkas Itinerary focuses on both the central and the southern Ionian Islands, as well as the Echinade Islands. The rewards of bareboat Lefkas sailing are many. Snorkeling, swimming, and sunbathing at pristine beaches is a delight. Scuba diving is excellent in the area (guided excursions required due to regulations). Exploring small towns and historic monasteries and castles, and relaxing at traditional tavernas is an indulgence not to be missed. Lefkas Island to Meganisi Island - 11 nm. Your Lefkas itinerary begins on the day you arrive at the base. Once you check in, purchase provisions (if you haven't elected to have us do it for you), and receive your pre-cruise chart briefing, board your yacht at 3:00 P.M. and get under way for a short sail to the south down the Lefkas Canal into the protected lagoon between mainland Greece and the island. Off the bow you'll see scenic Meganisi Island. It has plentiful coves and bays, most of which make fine anchorages. There are three communities on Meganisi, each with its own character. Spartakhori sits atop rugged hills above Spilia Bay and is quite beautiful. Vathi is a traditional little fishing port situated in a sheltered inlet, and Katomeri lies just inland. The pace of life is slow on Meganisi, a perfect way to ease into your Lefkas sailing itinerary. Mooring: No moorings are available. Anchorages are located at Spartakhori in Spilia Bay and in the inlet just off Vathi. The entire north shore of Meganisi is indented with small picturesque coves and bays excellent for anchoring. On the southeast coast is a bight above the spit where you'll find protection from northwesterly winds. Things to do: The three villages on the island are charming. You can walk the narrow lanes of Katomeri, the main town on Meganisi, and take in the quiet and modest ambience. The ports of Vathi and Spartakhori are also pleasant. The tavernas serve excellent Greek dishes and seafood. Winding roads lead inland, where you'll walk among olive groves and vineyards. Bicycling is popular as well. The beaches are plentiful. Meganisi has its share of sea caves, which are common in the Ionian Islands. Of particular interest is Papanikolis Cave. It's large enough to house a submarine, and evidently it did just that during World War II. The other famous cave on the island is the Cave of the Cyclops. Meganisi Island to Kefalonia Island - 15 nm. The next leg of your Lefkas sailing itinerary takes you southwest past the northern tip of Ithaca to nearby Kefalonia's northeast shore. The coves and bays along this stretch of the Kefalonian coast are absolutely beautiful, and the little port towns are picturesque and fun to explore. Fiscardo is situated at the far northeast end of Kefalonia, marked by two stone lighthouses. Farther down the west coast is Assos. You can't miss the looming Venetian fortress perched on the heights. If you're looking for seclusion, you can find it, whereas if you want to enjoy nightlife in a town, that's available too. The scuba diving is superb in Kefalonian waters, though you'll need to go on an organized excursion due to regulations. Mooring: No moorings are available. Anchorages are available at Fiscardo on the northeast coast of Kefalonia. The entire area has snug and secluded coves where you can enjoy the beauty and solitude south from Fiscardo. Farther south on the east coast are Efimia, Sami, and Poros. On the southwest coast is a large bay, where you'll find Argostoli, the island's capital. On the northwest coast of Kefalonia Island you'll find the picturesque town and anchorage at Assos. Things to do: Fiscardo is one of the prettiest little seaports in the Ionian Islands, well worth visiting for its shops and tavernas. At Assos, a tiny extension of Kefalonia connected only by a narrow isthmus, you'll find a serene and beautiful village. Going ashore to sample the local fare and climb the hill to explore the Venetian fortress is a pleasant way to spend an afternoon. The fort was built in the 1590s and offers some splendid views of the coast and nearby Ithaca. Near the village of Efimia, on the slopes of the second highest mountain on Kefalonia, is the Monastery of Our Lady Themata. Built in the 1000s, it's a good example of the monasteries that are so common in the Greek isles. The Archaeological Museum in Argostoli is fascinating, with exhibits dating back to prehistoric times. Also in Argostoli is the Korgialenio Historical and Folk Museum, which will give you further insights into the rich and diverse culture of the Ionian Islands. Facilities: Dockage, fuel, and water are available. Kefalonia Island to Ithaca Island - 13 nm. After enjoying your time on Kefalonia, set sail for a pleasant passage to the fabled isle of Ithaca, home of Odysseus (Ulysses), hero of the Trojan War and Homer's epic poem the Odyssey. The sailing is superb, with flat seas and fair winds, as the mountains of Kefalonia soar skyward, verdant and beautiful. 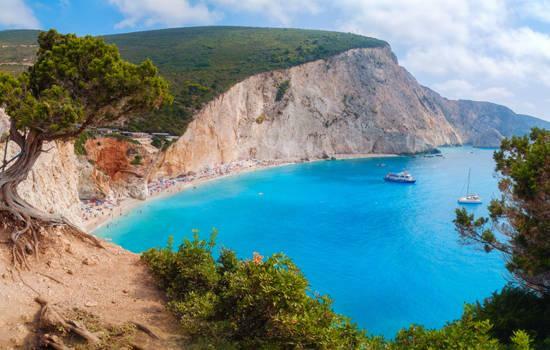 Kefalonia and Ithaca are superior cruising grounds, offering a mix of interesting towns with potential side trips inland, pristine beaches, and snug coves. Some of the best anchorages at Ithaca are in the ports of Frikes, Kioni, and Vathy. Going ashore to explore the villages and to savor a delicious meal in a taverna is a delightful way to relax. Mooring: No moorings are available. Anchoring is possible off Frikes, Kioni, and Vathy, though most sailors elect to dock at the piers. Vathy is situated in an inlet on the southeast shore of the Gulf of Motos. The gulf nearly splits Ithaca in two. A narrow isthmus is all that connects the north and south portions. There is excellent protection from northwesterly winds. An absolutely beautiful and remote anchorage lies in a deep inlet on the south side of the island, Andreas Bay. Anchoring in this fjord-like setting is like stepping back in time to the days of Odysseus. Things to do: Ithaca naturally has sites dedicated to its famous king, Odysseus. A pleasant walk or short taxi ride from Vathy, capital of Ithaca, takes you to Arethoussa Spring, where Odysseus, disguised as an old man by the goddess Athena, was recognized by his faithful pigs upon his return to the island, even before Penelope got to see him! West of Vathy is the Cave of the Nymphs, where Odysseus supposedly hid a vast treasure. Several ruins on the islands are said to be all that remains of Odysseus's grand palace. Renting a motor scooter is a great way to explore. Other inland sites of interest include the Kathara Monastery. You can climb the bell tower and admire a magnificent view of the surrounding islands. The fishing village of Kioni is the place to go to enjoy excellent tavernas. Ithaca isn't known for its lively nightlife, just the simple pleasures of a slow pace in a beautiful natural setting. Ithaca Island to Atokos Island - 10 nm. Just a short sail to the east brings you to the Echinades Islands, beautiful, unspoiled, and remote. These islands were named after sea urchins because the coasts are often sharp, or indented, providing you with a selection of snug coves and harbors. Atokos Island is uninhabited. Its craggy brush-covered heights run down the middle, rising to 1,095 feet at the highest point. You'll see Atokos long before you reach it. There are two anchorages. The one on the south side of the island at One House Bay is sheltered and quite beautiful, with the solitary house on the shore and the old church perched on the hill. The other anchorage is on the east side of the island. The snorkeling is exceptional. Mooring: No moorings are available. The best anchorage at Atokos is in One House Bay, named for the single whitewashed house (supposedly occupied by a fisherman) on the rocky shore. An old church sits on the hill above the bay. There is another anchorage on the east side of the island as well. Things to do: The natural splendor of Atokos lures many sailors to the anchorages off the south and east sides, where the snorkeling is excellent and the swimming is refreshing. Sea caves dot the rocky shoreline, which you can explore in the dinghy. Atokos Island to Kastos Island - 9 nm. Your Lefkas sailing itinerary routes you to the northeast to the long, low-lying isle of Kastos, another in the Echinades group. The Echinades are comprised of about 25 islands, most of them uninhabited islets with the exception of seabirds and wild goats. As Kastos draws near off the bow, you will find yourself entering the heart of the Echinades and marveling at the natural beauty all around you. The island has two anchorages. The best one is midway up the east coast in the bight just off the picturesque village of Kastos. Only 50 people live on the island year-round, and at the height of the summer the population increases to roughly 500. In the village are several excellent tavernas. Mooring: No moorings are available. The best anchorage at Kastos is off the village of Kastos midway up the east coast. Things to do: The village of Kastos climbs the low hills and curves around the small bay. Exploring the narrow lanes, hiking inshore on scenic paths, swimming at the beaches, and enjoying a meal at one of the tavernas is a delightful way to spend an afternoon or early evening. The view of the surrounding islands from the harbor is magnificent. There is a restored windmill on the island well worth a visit. The ancient ruins at Vigla are interesting. Kastos Island to Kalamos Island - 5 nm. Assuming you anchored off the village of Kastos the night before, you'll have a wonderful sail northeast around the north end of Kastos Island and the tiny Provato isle. As you pass the islet, a magnificent view gradually materializes. Kalamos Island, yet another of the larger landmasses in the Echinades, rises off the port beam to 656 feet at the highest point. Dense pine forests, rare in most of Greece, cover the steep slopes. The port and village of Kalamos is only a few miles to the northwest, where you can enjoy a delicious meal, amble down the narrow lanes, and take a swim at the nearby beach. Mooring: No moorings are available. The best anchorage is off the port of Kalamos. Farther down the east coast is Port Leone situated in a beautiful bay. The anchorage at Episkopi is exposed to northerly winds. Things to do: The port of Kalamos is a great place to go ashore to explore. As you walk the narrow lanes, browse in the few shops, or linger over a cool drink at one of the tavernas, you get a sense of what the Ionian Islands were like decades ago, long before the advent of busy resorts. Taking some time to visit a few of the many beaches is a delight, as is taking a leisurely stroll along the paths leading inland through the forest. The disused Port Leone southwest of Kalamos is intriguing. There's a centuries old bridge and a 200-year-old abandoned Orthodox church. Perhaps the most interesting is the nearby sea cave with a natural skylight that illuminates the interior, presenting a beautiful and yet haunting scene. Kalamos Island to Lefkas Island - 18 nm. The final day of your Lefkas itinerary takes you northwest, leaving beautiful Kalamos behind as you trim the sails for a windward crossing on flat water. The scene inspires the imagination as you consider all the history of this part of the Mediterranean. As the balmy wind fills the sails of your yacht, you will find yourself reveling in the special charm that can only be found in Greece. Arriving back at the base at Lefkas Town by 5:00 P.M., you'll have plenty of time to enjoy a sumptuous dinner at one of the restaurants near the marina, a fitting end to a leisurely foray into one of the best cruising grounds on Earth. Mooring: No moorings are available. Most of the anchorages worthy of attention are on the east coast of Lefkas. Starting from the northeast end of the island, you'll find the port of Lefkas and the appropriately named Lefkas Town, home of the base in the central Ionians. Most yachts tie up to the piers. 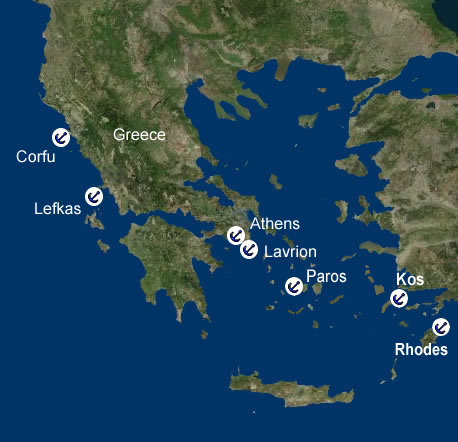 Dockage and anchorages are available at Lygia, Nikiana, Nidri, and Vlikho. Two of the favored anchorages among sailors are those at beautiful Sivota and Vasiliki, on the south coast. Things to do: Lefkas Town is a fascinating place to explore, with its varied architecture (in part because of a series of earthquakes that forced rebuilding). There are many tavernas, shops, boutiques, and four museums. The Phonograph Museum is a must for audiophiles. Farther to the south on the east coast you'll find quiet port towns, where you can relax at an intimate waterfront café and enjoy the scenery. Nidri is a major resort harbor. The nightlife is lively. Sivota is a must-see stop for sailors. Ashore in this picturesque harbor at the mouth of a lush green valley are some of the best fresh seafood tavernas in Lefkas. Vasiliki is the Windsurfing capital of the region. Sailing Lefkas waters also brings you to the islands of Meganisi, Madouri, and Skorpios, which is owned by the family of the late Aristotle Onassis. Of course, Lefkas is a tourist destination. Scuba diving (organized excursions only), horseback riding, golf, tennis, hiking, bicycling, and many other activities are available. Some sailors add extra time before or after a charter to experience the varied activities on Lefkas. After a restful night aboard, disembark from your yacht at 8:00 A.M. and prepare for your flight home. Alternatively, you can head into Athens to more fully explore this historic and beautiful city.